I have found the development of the “Life Wall” a very interesting experience, and sort of went to town on developing something that potentially could be reused in different contexts and used by others. Here are some notes I am making on its development. 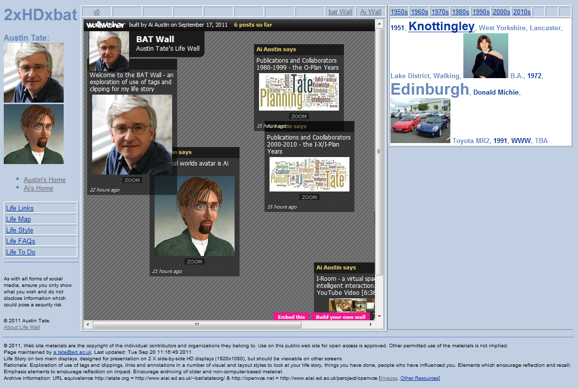 The Life Wall came about in September 2011 as Austin Tate was exploring social web and community tools for introducing students to one another on the Edinburgh MSc in e-Learning. WallWisher was used to let people post media clippings to show their interests. But other forms of exchange were also useful. Life Wall is an exploration of use of tags and clippings, links and annotations in a number of visual and layout styles to look at your life story, things you have done, people who have influenced you, etc.. Elements are included to encourage reflection and recall. Emphasis elements encourage reflection on the impact on your life of the things you include. The Life Wall encourages archiving of older and non-computer-based material. Life Wall is designed to be placed on two main displays, designed for presentation on 2 X side-by-side HD displays (1920×1080), but should be viewable on other screens. As with all forms of social media, ensure you only show what you wish and do not disclose information which could pose a security risk. The Life Wall concept could also be used for a couple. Developing the wall with your partner could be a fun (or surprising) experience and let you recall joint memories. Extensions to an entire family “Life x N” are possible. The displays are designed to be flexible and customisable. A CSS style sheet (“Life Style” – life.css) is used to allow for simple changes of font, style and colours of headings, bullets, etc. One display panel can include a pin board for media clippings, images, videos, audio files, etc. WallWisher is one possible choice for this panel. This entry was posted in EDC11 and tagged EDC11, IDEL11, Life Wall. Bookmark the permalink. I will add a comment here myself… on an issue that crops up in all uses of social networks and information exchange, especially where personal details are involved. Everyone should take care only to show what they are really happy to have stored forever. Once its in Google’s archive its there potentially forever remember. As we use social networks and social media more and more in e-Learning and for interaction with students, we do need to make sure we don’t encourage over exposure of innermost thoughts that could come back to haunt people in later life. Its especially important to help people adopt a social media sharing attitude which does have them think before posting. This is a great idea, Austin and I really like the neatness of your wall, its logic plus the use of the wallwisher, the google map, an interesting way of allowing others to peek into your life and get to know you. A good way to reacquainting with yourself too – as you mentioned, there are so many things that might have faded in our memory – and perhaps noticing new instances of causality or synchronicity in life? Will be certainly following the development of your wall. I agree with Ania, this is a terrific idea – it’d be good to develop it with the ‘visual artefact’ for the end of this block of study in mind, perhaps. Thanks for that pointer Sian. The Life Wall does seem to be a really nice structure for recall, and I am looking at some of the more visual elements like the “Life Map” now as giving lots of room for recall and quick visual presentation overviews. I have started to develop my own person wall,. and its amazing all the things it made me remembered, and look for related clippings or photos long buried. I had also started to think it could be developed with an eye to the final assessment for the Digital Cultures module.. which relates to presentation of professional or academic information as far as I can see… rather than more social and personal elements. So, I have started to make notes on “Life Wall Pro” just for that purpose. More on that in a blog entry soon.